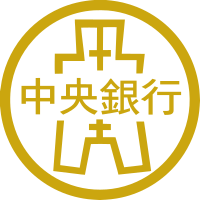 The Central Bank of the Republic of China (Taiwan) (CBC; Chinese: 中華民國中央銀行; pinyin: Zhōnghuá Mínguó Zhōngyāng Yínháng; Pe̍h-ōe-jī: Tiong-hôa Bîn-kok Tiong-iang-gîn-hâng), known in English from 1924 to 2007 as the Central Bank of China, is the central bank of the Republic of China, now commonly known as Taiwan. Its legal and common name in Chinese is literally translated as the "Central Bank". The central bank is administered under the Executive Yuan of the ROC government. Central Bank of China headquarters on the Bund, Shanghai (1930-1949). The headquarters building is accessible within walking distance north-west from Chiang Kai-shek Memorial Hall MRT station of the Taipei Metro. ^ "Central bank latest to drop 'China' label". Taipei Times. 11 Feb 2007. p. 1. ^ "Central Bank of China changes English name". The China Post. 2007-02-11. Retrieved 2007-02-12. This page was last edited on 3 April 2019, at 05:58 (UTC).